My friends, it has come to this. So we must make a decision. Do we jump off this Titanic of a show and spend our precious viewing hours elsewhere. Or do we go all in and commit to watching Smash until the bitter end. I, for one, am going down with the ship. 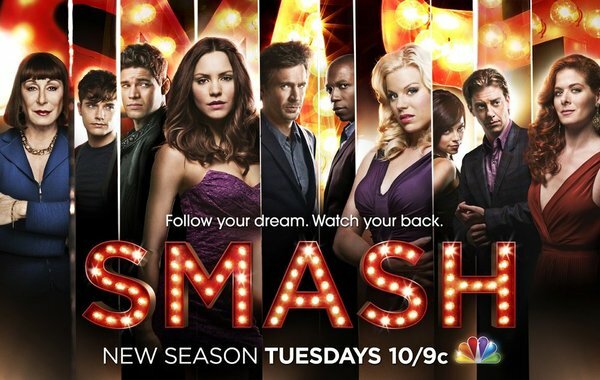 I will watch Smash until the last curtain falls. It’s moments like this when we need our fellow TV viewers the most. I decided we so need to form a Smash support group. Randomly send out a person to go and get coffee for the creative team. Pout and threaten to quit the group the moment someone disagrees with you even slightly (thanks to @sj_martin for this one). Drink martinis and throw them at each other (thanks to @beccarebec for this one). Blame all our problems on Jerry. Try to buy tickets for Bombshell and The Hit Lit. Debate whether Franco is a good match for Grace. Go out to eat and break into song for no apparent reason. Start to tell a story, stop half-way through and then NEVER revisit that story again. Are you still watching Smash? Do you want to join the Smash support group? Talk about it below and tell me what you would like to see happen during our weekly meetings. Remember, we are in this together.